The View From Inside The Boat. “Make yourself an ark of cypress wood; make rooms in it and coat it with pitch inside and out. This is how you are to build it: The ark is to be 450 feet long, 75 feet wide and 45 feet high. Make a roof for it and finish the ark to within 18 inches of the top. Put a door in the side of the ark and make lower, middle and upper decks.” God’s words to Noah to build an ark from Genesis 6:14-16. The instructions seemed straight forward but the reasoning seemed odd. God was going to flood the earth and destroy everything and everyone on it except Noah, his wife, his three sons and their wives and the animals God led to the ark ahead of time. The reason it seemed odd is because it had never rained yet so trying to wrap their heads around the idea of a “flood” was a little difficult. But as we know Noah obeyed, God stayed true to His word and the earth was destroyed. Some friends and I went and visited the Ark Experience in Kentucky. 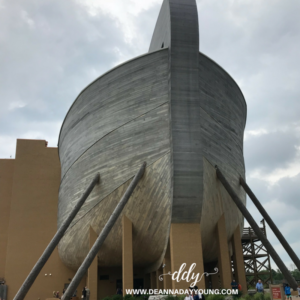 Staying pretty true to size with Noah’s boat, the Ark is the biggest timber-frame structure in the world. It was amazing walking through the three decks and seeing artistic replicas of how the creators interpreted life to be in Noah’s days. As you walk from room to room and read facts and stories of how scholars believe the details of housing thousands of animals worked, you find yourself wrapped in the awesomeness of this big, massive boat! There were cages, large and small, with replicas of all kinds of animals they believe may have been on board. There was one section depicting the artistic view of living quarters for the family. There were videos, artifacts and interactive screens to try to help explain questions people have around this event in history. As my friends and I were finishing the last room of our tour, the lights went out. We heard no screams; no cries; just calmness. Within a few seconds the lights came back on and word spread through the Ark that a severe thunderstorm storm was within 30 minutes of our location. What better place to be than on Noah’s Ark during a severe thunderstorm! We headed to the bottom deck (also labeled the storm shelter) and watched through the windows on the Ark as the rain came down in sheets and the wind snapped picnic umbrellas in half, trees danced heartily in the wind and thunder rolled through the land. It was surreal. Being inside the Ark during a thunderstorm. It only lasted a little while. We strolled the gift shop until the rain stopped. People were calm and orderly, kind and warm. No worry; just a God-directed experience ending a beautiful day on Noah’s Ark. This entry was posted in Uncategorized on June 1, 2018 by Deanna Young.